Burgums and Burghams of the "AA" family tree lived here, or nearby. ABSON ST JAMES, is at the centre of the village dedicated to St James the Great, with it's churchyard and many graves. The church is a Grade 1 listed building, as are the church yard walls of Bristol black coping, and many of the graves. The church contains an early 1600's pulpit with a sounding board and 18th century woodwork. The belltower contians six bells, which are routinely rung by hand. Click the picture right for copyright; click back to return). The most interesting of the church is an external carving high up in the outside east wall. 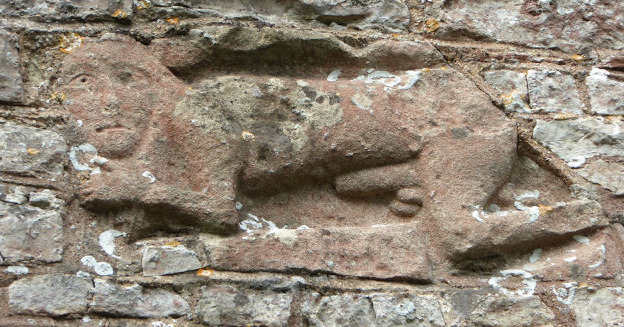 It is a lurker or "Sheela na gig", a sexually explicit carving of a figure, in this case a man (see the picture below). Elsewhere, they are more commonly women. There is some dispute about the age and origin of these figures. Some suggest these carvings date from the Norman period and are to portray a sexual figure (more commonly a female) as grotesque and sinful. However others believe the daing of these figures is earlier and from older structures, probably Saxon, and that they are remnants of a pre-Christian fertility religion. Possibly they were taken from earlier buildings and then incorporated into the wall of an early Norman church. Reasoning for this includes the fact that sometimes the carving is of a different material or is lying in the wall on its side. Either way it is curious and unusual. The list below shows the baptisms, marriages and burials that took place at Abson. Margaret Burgum 26 Jun 1793 Abson St James Marriage m=John Smith AA? Sarah Burcomb 30 Dec 1806 Abson St James Baptism P=Thomas + Sarah AA? Sarah Burgum 05 Feb 1815 Abson St James Burial Age 53; b. 1762? AA? Hannah Burgum 17 Jun 1819 Abson St James Burial Age 18m; b. 1817? AA? Charlotte Burgum 18 Jan 1821 Abson St James Burial P=Thomas + Sarah AA? Click here for more about Abson and some of the Burgums and Burghams who lived there.